I love the team over at IQ Power Tools for several reasons. First, their dry cut tile saw revolutionizes tile cutting. You should check it out if you haven’t seen one in action. Second, they seem to love numbers just as much as I do. Data-driven geeks of the world, unite! In an article discussing a better understanding of silica dust and Table 1 regulations, they break down how much silica dust you can potentially breathe in by making just one cut in a 60 mm (2.36″) paver. The blog post breaks down the math in much greater detail, so check that out if you want more proof. 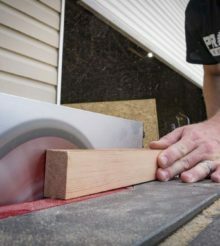 They use a 2.36″ x 4″ paver for their example and show how one cut removes 1.18 in³ of material using a 0.125″ kerf blade. Based on the weight of the paver, you get 45 grams of removed material. Since silica makes up roughly 20% of masonry materials, that leaves you with 9 grams of silica in your 45 grams of waste product. Now we have to get scientific and convert grams to micrograms. 1 gram = 1,000,000 micrograms, so our cut produces 9,000,000 micrograms of silica dust. It’s just 50 micrograms per m³ of air. The average Pro can inhale up to 840 micrograms of silica dust in an 8-hour day. That one paver cut produces enough silica dust for 10,714 days at the PEL. That’s more than 34 years worth of 6-day weeks and no vacations. While many companies are motivated by avoiding fines for silica dust violations, individuals need to understand the risks of silicosis. Pros with power cutters who dry-cut everything in sight with no PPE or dust collection risk much. They might be headed for an unpleasant and possibly early retirement. OSHA sets the PEL very low. However, their goal is to get Pros into compliance for better long-term health.